Even if you don't possess the green thumb necessary for an indoor garden, you can still bring the tranquility and beauty of nature into your home or office with artist Melissa Moore's illuminated ecosystem. A minimal, contemporary bell jar frames and protects the fragile mosses and spindly greens inside, which stay ever-verdant in a state of pause. When aglow with the light of the elongated, unobstructed bulb, this miniature environment is brought to life, as if in displayed in a vintage exhibition of natural curiosities. Assembled by hand in Baltimore, Maryland. 8" H x 5.5" dia. Care instructions: No watering needed. 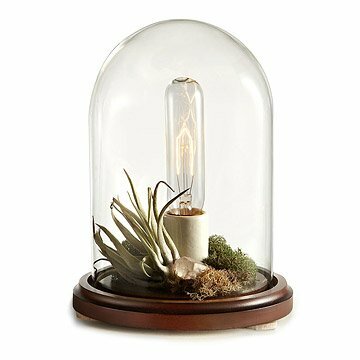 Contains preserved moss and air plants. Functions as a task lamp or ambient lighting element. Requires one 15W or 25W T10 bulb (included). This is a beautiful lamp; however, I had to get a replacement (the first arrived broken), and found that the second one was slightly less impressive, as it contained the tiniest air plant I've ever seen (the first had been much more reasonably proportioned). Otherwise, it's bright, attractive, and very much as pictured. My sister-in-law loved it! Bring the tranquility and beauty of nature into your home or office with artist Melissa Moore's illuminated ecosystem.